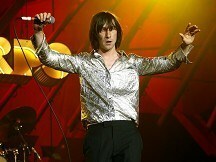 Belfast was packed as Primal Scream returned to the city centre. Classics like Country Girl and Come Together underpinned a set based upon the Screamadelica album from two decades ago. The band, fronted by Bobby Gillespie, performed in the intimate outdoor surroundings of Custom House Square before a crowd of mainly 30-somethings. The Scottish alternative rockers drew an enthusiastic response from the crowd with an eclectic set, at times psychedelic and at others classic rock. There was a stage backdrop which for periods featured images of running blood and at others a single eye. Screamadelica was a great commercial success, reaching number eight on the British charts. It is now widely considered to be a landmark album of the 1990s, and is notable for having won the first Mercury Music Prize in 1992. The Belsonic festival features nine nights of music across a range of genres. Jay-Z has compared Beyonce to the late king of pop Michael Jackson, hailing her as the "second coming". Ozzy Osbourne could be reuniting with Black Sabbath for a new album and tour, according to the group's guitarist Tony Iommi. The new judges in the X Factor have given the show "a whole new energy" according to veteran Louis Walsh. Gary Barlow has defended The X Factor, saying the success of some of its acts has helped record companies support "credible artists".